Travel, Freedom and Financial Independence funded by the Internet. Here is a very interesting post by Jodi over at legalnomads on how travel can really help you get some perspective in life in general. I can whole heartily agree with here point on this especially after spending 2 months recently in south east Asia. You can think you have it really bad until you see how others live in the third world. No discussion about returning from a prolonged period abroad is complete without thorough time devoted to reverse culture shock. And within the larger folds of a discussion about reentry, the conversation inevitably turns to perspective. Specifically, that people don’t seem to have any. Of course this isn’t a fair statement, but coming off of long-term travel to the developing world often leaves you in a fastidious state of mind. However, there is something to be said about travel also crystallizing your perceptions, honing suspiciously naïve sentiments into firm sets of belief. Even within the context of culture shock, it can help keep life in perspective. And if you concentrate enough, it can help mold you into the person you strive to be. I was exhausted when I arrived, coming off of a fairly ridiculous gauntlet of nightbus to daybus to tuk-tuk. I checked into one of two places in town licensed to house foreigners and joked with the other tourists that I was going to sleep at 7 and if they didn’t see me in the morning, it merely meant that I was planning to sleep thorough another day. 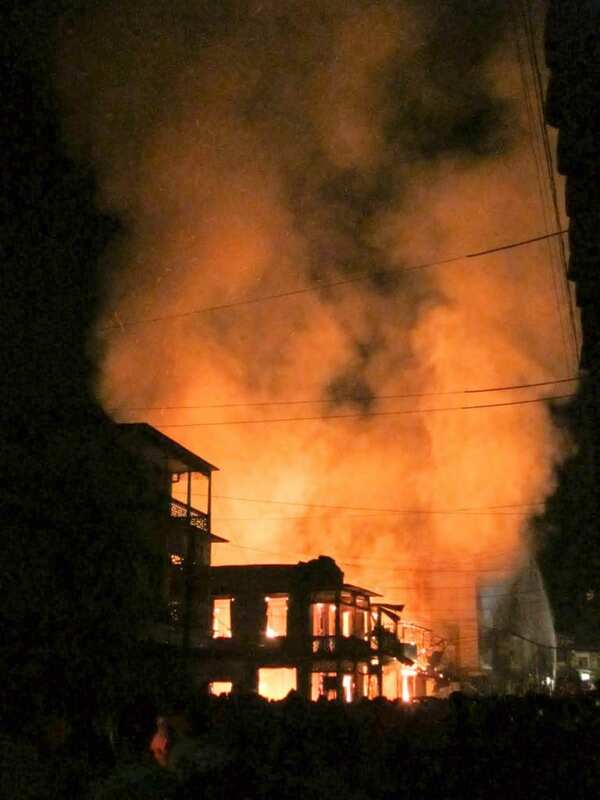 I went to sleep at dusk and woke up to faint screams and panicked scurrying in the attic, the Rakhine boys who worked at the hotel trying to stuff their belongings into a bag. Disoriented, my mind in still cobwebbed from sleep, it didn’t register that the air was thick with smoke. I tumbled out of bed and ran down the three flights of stairs to the street. 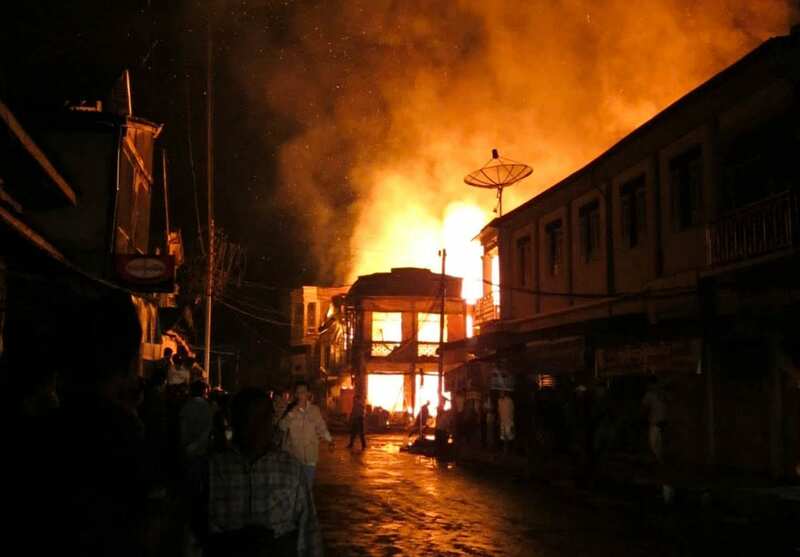 Several buildings were on fire, and given that much of the town was made of wood and that it had no fire station, people assumed the worst. Next door to the hotel was a doctor’s clinic and women ferried in and out carrying supplies to waiting trucks. Grabbing the most expensive ones they could find (a microscope, medication, laboratory equipment), hoping to save what they could. One woman stopped to catch her breath. “This is all,” she blurted out, roughly gesturing to the chaos behind her. The hotel owner explained: no insurance, no savings. If her clinic went down, so did everything she had. One of my closest friends returned from a contract in Ghana only to find he wasn’t empathetic to his friends’ complaints about the weather or traffic. They called him irritable; he called them snobby, told them they lacked perspective. His friends did have perspective – it just wasn’t along the lines of what he was prepared to digest. It was embodied differently: less stark, less earnest, but nonetheless present. I gently suggested that he lacked some perspective too; in straddling the world between Africa and the States, he couldn’t relate to either. Having returned several times during my years of travel, I understood where he was coming from. I remembered the frustration of knowing that my mental state didn’t jive whatsoever with those around me. I remembered looking out at the Brooklyn Bridge and thinking “I’m over this. Where’s the sticky rice?” But as I slowly seeped back into the world I used to know, those ragged edges smoothed and conversations became easier. I learned to enjoy the Brooklyn Bridge again. (But I still missed the sticky rice). Which brings me back to Burma. 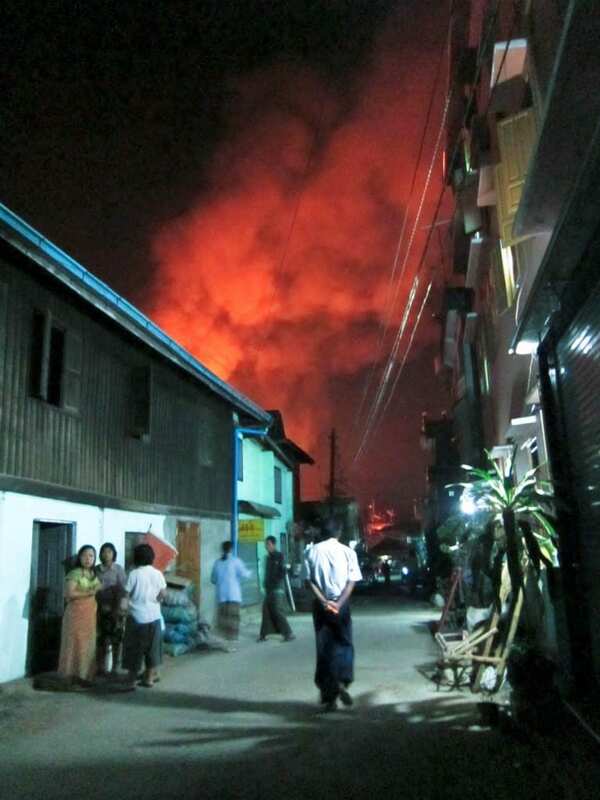 During that sleepless night as the fire spread through Hpa-An, the few foreigners in town ran out to help. Of course we did! We offered to carry water, to help evacuate, to carry goods from store to store. And as I ran around I told myself to remember this moment for when I got home. Why? Because I knew that in going home I would get caught up in the resentment of feeling like I didn’t belong. I knew there would be moments where I would fail to see the forest through the trees. I wanted to remind myself of the invaluable perspective I gained by being present in Hpa-An, that floating-above feeling of seeing one life as part of a wider tapestry. And you know what? When I lost all of my travel memories in a robbery back in the fall, this is what I remembered. Hpa-An. Hpa-An and all of those other hairline moments, tiptoeing the tightrope between life and loss, many of which I’ve never written about. It’s not a matter of sanctimony – believe me, I cried serious tears when I found out those photos (along with my laptop and camera and hard drives) were gone. But in keeping these moments close, in trying to cross-reference where I am with where I’ve been and the lessons I’ve learned, I keep my own perspective intact. Remind myself of what really matters in life. This isn’t why I travel, but it is important; it keeps me calibrated. Whatever aggregate frustration or culture shock or negativity I’ve built up, even when things feel like they’ve hit rock bottom, it could always be worse. This is one of the many gifts that travel gives us. We always say “try to put yourself in their shoes to understand.” But when your travels necessitate that you do so – be it for a moment, or a week or a sleepless night in a tiny river town – the comparison solidifies into something you can come back to, time and time again. Athens the capital of Greece and one of the most famous cities in the world, named after the goddess Athena. Ancient Athens was a powerful city-state, considered to have been the cradle of Western civilization and a renowned center of learning, home to Plato and Aristotle. Modern Athens is a bustling cosmopolitan metropolis, home to over 3 million people. It is also one of the most popular tourist destinations in Europe. May-June and September-October are possibly the best month to visit to avoid the heat in July-August. Syntagma square in the heart of the city is a great place to start touring the many historic sites including the Acropolis which is the one you cannot miss and is within walking distance. The Metro is best for getting around to avoid the traffic. A visit to the islands is also a must. Take the metro from Syntagma to the port of Pireaus and high speed ferry to Mykonos or Santorini. The most famous landmark in Athens, this large hill lies in the center of the city and contains a cluster of ancient ruins. This is also a must see. Houses a large collection of Greek and Egyptian artifacts. Mykonos and Santorini are my favourites. Paris the City of Light on the river Seine is the capital and largest city in France. It is also the city of romance. Paris is without doubt the leading center of fashion, culture and gastronomy. Paris hosts a rich array of museums, art galleries, and nightlife and is the most visited city in the world. There is ample opportunity for shopping or just people-watching, especially from the vantage point of many atmospheric cafes. From sunrise strolls along the Seine or on the Champs-Elysées and it’s other grand boulevards. Paris’s beauty is still overwhelming, especially at night, when it truly is the City of Light. The best time to visit is in the spring. Allow at least 3 or 4 days to see the main attractions. There is so much to see and do you could spend weeks there. Public transportation, especially the underground Paris Metro / RER, makes it easy to get around to many attractions and neighborhoods. If you have kids the Euro Disney is just a short Metro ride away. If you have the time then a day trip to Versailles the stunning palace of Louis XIV, the Sun King or a short trip to Notre-Dame de Chartres a magnificent medieval Cathedral with some of the oldest and most beautiful stained glass in the world. The Eiffel Tower – The best known landmark in Europe, the Eiffel Tower is the symbol of Paris. Arc de Triomphe – Built to commemorates Napoléon’s victories is located at the end of the Champs-Elysées . The Louvre Museum – One of the world’s most famous museums which houses the Mona Lisa and the Venus de Milo. Sacré-Coeur – A Roman-Byzantine style basilica located on the Montmartre Hill. Notre-Dame Cathedral – Built in the 1100′s, it is one of the oldest buildings in Paris.